I'm not a fiber artists, but as I sat next to two good friends last year on a plane bound for Michigan on a girls weekend, apparantly they thought I should be! They also thought my name was not artsy enough and so they dubbed me Macee, which has since stuck. We sat side by side knitting as the balls rolled under the seats. Ok, THEY were knitting and I was trying to knit, since I haven't picked up yarn in years. Mom taught me to crochet as a kid, but I stepped away from those toilet paper covers a long time ago. Most of you who are wonderfully experienced fiber artists, to include my good friends, would have this scarf done in one sitting. Not me, it took me forever because I forgot what I was doing, got side tracked and then had to be taught how to do it again. 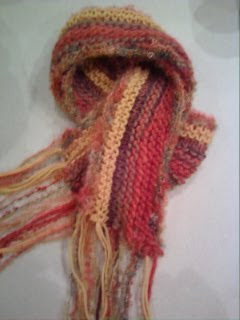 It also took a little youtube.com instruction as well to finish things off, but alas, here is my first knitted piece. 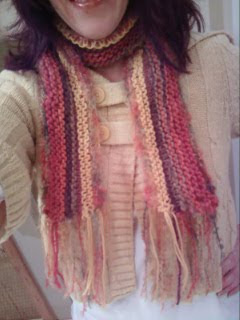 Though it may not be perfect, it is finished and I've moved on to the next scarf in between making jewelry! After lots of hard work and a great artist to partner with, The Hard and Soft of It show went off beautifully! A new direction for me. What a fun collection of jewelry to work on and have available to the public and what a neat way to present "hugs and kisses". This is becoming part of the wholesale line and will be avaible to retailers very soon. Jean (Barnes Downs) explored new directions and has such a great way of exposing texture and this happens to be one of my favorites! More "hugs and kisses"! I love the way the softness of the idea behind a gentle kiss can be combined with such hard steel & brass. Our opening mug shot! More importantly, look at Jean's organic works in the background. Her works are always wonderfully soothing and if you happen to explore the new hospital (Western Maryland Health Systems - Cumberland, MD), her artwork can be found in the halls surrounding the waiting area on the Outpatient Surgery floor. You can explore more on Jean at http://www.solitudestudio.com/. More fun, colorful and fuzzy! This bracelet stretches over the wrist and reminded me of the days when sweat bands were cool to wear on your wrists and head! Hum.... 70's, plastic, wool & bullet casings.... what a combo! Since the fall and winter season was very full of festivals, shows or holiday orders, we decided to take off to Barbados where it is between 72 & 82 degrees year round. I loved the night because of all the really cool lighting used around this quaint 21x14 mile island. It provided, in this instance, a wonderful backdrop to really cool silhouetted models! Every walkway was lit with recessed lighting. It was either organic in feel or geometric. What great arched doorways. This one led to our villa. The doors all opened but contained decorative rod iron bars, but were perfectly laid out to allow the air to really circulate. The lighting created such a wonderful ambiance at night. We were sucked in by it. Outside, leading a wonderful stepping stone path around the entire villa, were these wonderful lights. A perfectly warm evening, a glass of wine and a walk in the fresh air with my family proved to be very special. You can't stay out of the water at Barbados! You can swim, snorkel, ride water craft and even surf on the East side of the island. We chose to make arrangements through a fabulously eco-friendly small business called - what else - Ecodive! (http://ecodivebarbados.com/) This business is small and personal and truly believes in catering to tiny groups of adventurers. Our two days consisted of either diving, snorkeling or swimming with sea turtles. What a professional, yet very friendly staff! We truly enjoyed the time spent with them as we snorkeled above old ship wrecks in Carlisle Bay Marine Park. While Mikey entertained us with his sweet humor, Andrew was a bit more serious, giving us the skinny on the island, its people (Bajan or Barbadians), its culture, its food (flying fish, bajan rice, roti and mac pie - of which we had all of them while on the island made at the hands of the locals) and whatever else his wonderfully packed mind could dish out in our two days with him. If you ever make it to Barbados, you seriously have to look him up! A baby sea turtle at the beginning of our journey, but the ones we had the opportunity to swim with were about 4 feet in size. Mikey provided my daughter with sushi as well, but I couldn't get over the true blue color of the water and the natural textures of the waves. It made the water look shallow, of which, it was not. Nothing artsy about this, but it sure was fun! Andrew explained, this is where the sugar from this British island is loaded on to the huge ships and is also where the cruise ships come in. I thought they looked like little robotic creatures. Sugar is what Barbados has harvested and is known to export, well, along with RUM! Mmmmm and trust me, I had a few of Big Dave's rum punches while hanging out on our beach. My daughter had the opportunity to shop for her friends with a local art vendor in the area of Speightstown. There was a great local art shop nearby I found myself lingering for quite some time. A little bunch of trees right? Uh uh, nope, a huge bunch of trees and located right outside our villa. Everywhere you turned, you'd see just a peek of ocean and a perfect spot to just wander through to put your feet in the sand. This also was in Speightstown, not far from our villa and on the calmer West side of the island. Salt is naturally doing what I try to accomplish at times in my metal sculptures. In Speightstown, we stopped to try some local food, in this establishment, we had the islands Mac Pie. It is sort of like mac and cheese but doctored up the island way. It is rib sticking and delish! This cool cut-up doorway led into the kitchen. Along our walk as we sucked in more of the ocean air. I loved the repetition of the stones and lights. Churches can be found all over this eastern most West Indies island and the island is divided up into 11 parishes. Rush hour is around 3-4 in the afternoon as all of the local children descend upon the local bus systems widely used across the island. At times the sidewalks were packed with children, all clad in their different colored uniforms. The roads were shared equally (no road rage allowed) by children, horses, cars, bikes and the like. How refreshing as the drivers were quite courteous, even to the many tourists who had to adjust (ahem, like us) to driving on the left! Deeper into the island we visited a very cool (even if commercial) pottery shop called Earthworks! Hum, I wonder how long it took them to tile this wall, along with the many other walls that decorated the surroundings? This was available at the shop, but it wouldn't fit into my purse to bring home! Darn. How would you like the ability to have that much clay available to you at any given moment? Large pottery bowls ready for firing. Their kiln actually slides on a track system on the floor to cover this entire stack of pottery to be fired at one time. Some colorful, finished pieces. Their pottery is available at many of the stores and shops around the island. These will make a lot of coffee drinkers happy! Even their pile of scrapped junk pieces looked cool! Another wonderful church at one of their many round abouts. Built in 1836, St. Thomas Parish Church is not along the coast line, therefore we found ourselves lost deeper in the island. That being said, have I mentioned that Bajan people are the friendliest group of local people on any island I've ever visited and in this instance, one very kind man helped us find our way again. It always amazed me at how accommodating and how kind they are to one another and to tourists. One of our final sunsets on our villa's beach before we left the island. I took so many images of the ocean crashing along the beach, picking up on the wonderful textures that were created. It was mesmerizing and a wonderful way to end our trip, that was simply too short. The view on our somewhat turbulent, but gorgeous flight above the friendly skies and ocean, as we dreamed of the day we would once again return to what has quickly become our favorite vacation spot. The beaches were wonderful, the restaurants yummy, the pace SLOW and the island large enough that we simply HAVE to return to explore more of its hidden treasures.